beans ‡ (fig.) They sat in the sun roasting themselves. This tutorial has been developed for people who want to try roasting coffee in the oven, but don’t know how. An introduction and a step-by-step procedure will let you know what you need to get started. Previous knowledge about roasting methods is useful, but not necessary to get you through this tutorial. Oven roasting is, to the coffee devotee community, one of the lesser-known (and certainly less often talked about) roasting methods. The machines that people seem to know most about and use the most are hot air roasters (popcorn poppers or commercially available small quantity roasters like the Imex, I-Roast, Hearthware Precision or the Sivetz sample roaster) or drum roasters (homebuilt gas or coal BBQ Roasters, or electrically-heated small-quantity drum roasters like the HotTop, or the Alpenröst). When I started roasting, I had no idea all those fancy roasting machines even existed. I simply did what my girlfriend at the time had learnt at the local coffee house (Mauritz Kaffe, mentioned below) and had told me: use the oven. It wasn’t until after a year of reading and posting on alt.coffee and searching the coffee resources on the internet that I started to realise almost nobody outside of Göteborg uses the oven... To me this is very strange, and I wonder if it could be an indirect result of the widespread myths about the mysteries of coffee roasting that have been around since the late 19th century or so. If it is so hard to roast coffee, surely you can’t use something as obvious and common as the oven? Seen from another point of view, almost any food can be prepared in the oven with great results. Why not coffee? If you have an oven, you can roast. Since most people have one, or at least have access to one, most people can roast without buying extra roasting equipment. 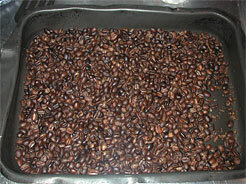 You can roast larger quantities than with the hot air methods (popper, Imex et al, heatgun). A typical oven roast is around 200g but you could easily roast 500g. Roast profiles are not possible in the same way as with a modified popper or a drum roast, since the oven can´t change roast temperature as quickly as the other methods (well, perhaps ovens with fans - I have never tried one). Still, you can control the roast to a degree - see below. Uneven heating may be a problem in conventional gas or electric ovens without fans. Some ovens are better than others in this. In any case, I´ll outline a simple fix for that below. It should also be said that some people just don´t like the taste of oven roasts. But of more significance is the views of coffee gurus or celebrities that dissuade people from trying the oven because it is not “good enough”. Among others we have Kenneth Davids, who thinks that oven roasting in conventional ovens (contrary to gas ovens, which he likes) doesn’t work because the results are too uneven, and that fan oven roasting with its longish roasting times yields a muted aroma (read his book “Home Coffee Roasting, ISBN 0-312-14111-4, most of it is on p132-133.). His book is good and I like it a lot, but this, in my experience, simply isn’t true - at least not for a reasonably large (roughly 60x60x60 cm externally) European standard 220-240V oven. The oldest coffee house in Göteborg, Mauritz Kaffe, is living proof that conventional oven roasting works in a commercial environment with demanding customers. They also sell green beans and hand out a small leaflet with much shorter instructions than in this tutorial, telling people how to oven roast, which is probably one of the reasons for oven roasting being popular where I live. But the oven does have its own taste profile, as do all roast methods. To be fair, if we sum up all he has written about it in “Home Coffee Roasting”, Kenneth Davids has classified the oven roast taste quite well: less varietals and brightness/acidity, but more body. Also, he has some noteworthy suggestions for improving oven roasts. We will look into one of them further on. Q: What oven can you use for roasting coffee? 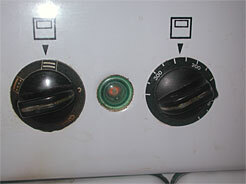 A: Any oven, provided it has even enough heating and enough oomph, as in kW (or BTU if you wish.) You need to be able to set it at 250°C, less powerful ovens won’t do. Q: How much coffee can you roast? A: Depends on the size of the oven. I almost never go beyond 500g, and I almost never fill up a full size oven tray. Instead I use smaller baking tins, around 5 cm deep, thin-walled ones, and usually roast between 200-300g. Q: What else do I need to start roasting? A: Coffee beans. Something to stir with and a towel or oven mitt so you don´t burn your hands when taking the beans out. You will do so several times, not only once. Oh, a timer is very nice, but a simple clock will do just as well. Q: At what temperature do you roast? A: The theory says somewhere between 200-225°C. In practice, I like roasting between 225-250°C because I take the beans out once or twice (or three times) during the roast to stir them. Q: Can I blend before roasting in the oven? A: If you can do it with a popper or a drum roast, you can do it with an oven! Some beans are harder to pre-blend than others. Robustas or aged arabicas are best roasted on their own because they require different roast profiles. But personally I would go crazy if I had to roast 3-6 times in a row before being able to drink my coffee. Q: Is the oven roast the best roasting method? A: No. But it is good enough. And it is gratis, if you already have an oven. And you can roast a lot more than with other methods, plus you can do other stuff while roasting (well, maybe not a lot, but at least you can do the dishes - as long as you keep watching the time). And, last but not least, if you have an air roaster (such as a popper) the oven is a good complementary roasting method: oven roasts have more and fuller body, while air roasts usually have a brighter taste and bring out more of the varietal/spicy flavours. Now, before the step-by-step instructions, please allow me to digress a little. Many people have, since commercial roasting companies took over the coffee market sometime in the mid-1900’s, claimed that coffee roasting is very hard to do. They say it is impossible to roast coffee in the same way that the big roasting companies do, and it shouldn´t be attempted in the home, but left to those same companies. So, the best coffee you can get is already at your nearest superstore, preground and neatly packed in comfy vacuum-sealed brick packages. As you are reading this tutorial, you probably don’t give a fetid dingo’s kidneys for such statements. In other words, you may think that it is exaggerated or outright untrue. And you would be right! What might be less self-evident is that as the coffee consumers stopped roasting themselves, not only did they lose the basic knowledge about roasting, but they also lost the connection in their minds between how freshly roasted beans look and how they taste. Also, the industry-led change in the consumers’ way of thinking about green beans from around 1850-1950 had repercussions in the mindset of the born again coffee roasters of the 80´s and 90’s, namely in the way they looked at coffee roasting. Roasting was now viewed as something hard, something you need very special equipment to do. Now, let´s just take a few steps back and look at this issue. 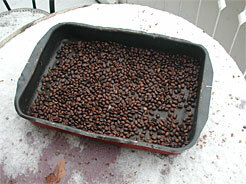 It is hard to roast coffee beans evenly. So what? Many other types of food also react this way to roasting - almond flakes, for example. Do we mind? Would we buy a special almond flake roaster unless we were starting a really big baker’s shop? What did our ancestors do, the ones that lived at the turn of the last century? They roasted a heck of a lot of coffee themselves, using bean shakers, frying pans, small charcoal grills with manually rotated drums, ovens and that kind of stuff. Oh, and in some areas there were local micro-roasters that travelled around selling freshly roasted coffee, taking their roasting machine with them. What equipment did the micro-roasters use? Well, nothing with micro-processors, that´s for sure! Small, very simple manually rotated drum roasts on a small charcoal grill or gas heater for example. Do you think they had extremely even roasting results, minutely timed and always with the same roast degree and a controlled roast profile? I don´t. What they did use was - most likely - common sense and their experience of the roasting machine they had access to. How do you think the coffee looked, tasted and smelled? Well, it probably smelled like fresh coffee - marvellous! And it probably tasted like fresh coffee - wonderful! If the roast came out very uneven - and you bet it did sometimes, at least for those that used a frying pan - they soon found out how to make it better by stirring the beans or finding a better vessel to roast in. But the most important point here is that they weren´t afraid to drink what they just roasted just because it was a little uneven! Nobody should be; no more than we are afraid to eat the lovely topping on an almond cake because some of the flakes are a little darker than others. By the way, if you already use a popper, please feel free to have a look at individual roasted coffee beans coming from that roaster. How does the surface colour look? Is it very even or slightly mottled? Are there cracks or even cracked beans? 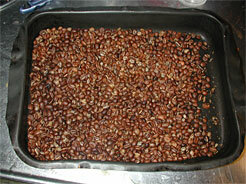 Air roasted beans don’t look at all as good as beans roasted in a gas or electrically heated drum. They taste great, though! Just different. The underlying message from the coffee industry digging into our subconscious self all the way from the 19th century and onwards is: “You can’t roast. But we can. Buy our coffee.” In reality you will find that the quality of the coffee bean is much more important than the roast method or roast evenness! Even if we roast them in a frying pan on the stove, freshly roasted still will be in a class of its own compared to preground. Now, since we are all rational, quality-seeking people of the 21st century, we will want our roasts to be as good as possible to bring out the best in those green beans. This does mean that we want to avoid roasts that are too uneven. A little unevenness is fine. It only enhances the taste spectrum and you will get more taste from your beans. Some of the best beans also have an intrinsic unevenness, especially the aged beans, e.g. Old Java, Old Brown Sulawesi and Monsooned Malabar, but also others, for example Moka Sana’ani and non-aged Sulawesi. But if half of the batch is still yellow and the other half is almost black, something is wrong. This said, I will now add some words of encouragement by saying that my oven roasts are more even than my heatgun roasts. 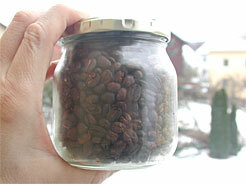 You may also consult “Home coffee roasting” for a detailed description of gas oven roasting with many tips. I will focus on the problem of hotspots and how to solve it. 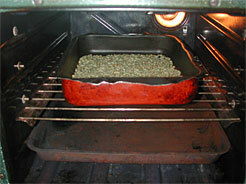 Hotspots are the main cause of problems when roasting in the oven. Both conventional and fan ovens will have hotspots , perhaps caused by air convection, perhaps for other reasons. What can we do to even the hotspots out? First, we can try to find them. Kenneth Davids suggests a method that goes something like this: put a piece of greaseproof paper on a perforated oven tray or the like. Let it sit in the hot oven until you see that it is getting brown from the heat. Take the greaseproof paper out and note where darker areas are. These are the hotspots. Take out the perforated tray, fasten bits of household aluminum foil to it on the areas where the hotspots are and put the tray back into the bottom of the oven. The hotspots should now be broken. Personally, I have been too lazy to do it this way. Our oven is not a fan oven. Instead, I put a full size (old rusty and otherwise useless) roasting tin in the bottom of the oven. This has diffused our oven´s hotspots enough for the roast to be comparatively even as long as I take them out once or twice and stir them while roasting. At last, we come to the step-by-step instructions. Times are for about 200g of non-aged coffee beans in my baking tin and with my oven set to 225-250°C, but they may of course vary a couple of minutes up or down depending on... oh so many variables. Consider them very approximate. Also, the roast times were a bit prolonged on this occasion since I needed to photograph the beans every time I took them out. When the oven is hot, in with the beans – in the middle of the oven. Grassy smell. After around 3-4 minutes you will detect a smell reminiscent of grass, or rather straw. 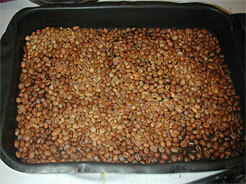 The roast has begun and you will see the beans getting slightly yellowish, one by one casting off their greenish colour. If the oven temperature is a lot too low, the roast will never get further than this. Start of first crack. Around 5-6 minutes first crack starts (the beans start cracking, a little like popcorn). Take the beans out, look at them! Are there any clearly visible hotspots yet? Usually the centre will be lighter than the edges. Now stir the beans around. When you put the baking tin back, turn it around 180°. End of first crack. Around 10 minutes, we are getting to the end of first crack. Take the beans out and have a look again! Are they too dark already? Then lower the temperature by about 25°C next time. Could they use a harder, faster roast? Then put them on the top shelf or just under it when you put them back, but don´t forget to stir them around first. In this case, I decided to put the beans on the top shelf for a while, making them roast more quickly - all that photographing had made them slow down too much for my taste. For people that don’t roast into second crack, this might be the time to take your beans out. Judge for yourself by look and smell. Second crack starts. Smoke is getting bluish, kitchen is getting seriously foggy. Signs you should look out for are oil on the bean surface and a strong smoky smell. If it is only a little oil, it will creep back into the bean again during the rest period, giving it a silky sheen. If it is a lot of oil, it will stay on the surface of the bean and you have a French roast. Or charcoal. I usually let my beans cool down out on the balcony. It works pretty well in my windy environment. 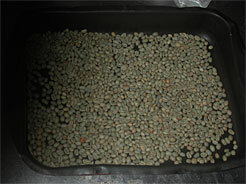 Perhaps you would like to try water quenching (spraying short bursts of water over the beans) or using a fan to make them dry faster - well, in winter I just pour the beans over to any cold oven tray and put it down on the cold table surface. On the image you can see there is some snow. Snow is not a requirement, but it speeds up the cooling a lot! In spring, summer and autumn I heartily recommend some kind of perforated plate. It also speeds up the cooling process a lot. You can shake the plate a bit and blow off the chaff before leaving the beans to cool down (if you are outside, like me). Don’t worry too much about the chaff though, it is mostly harmless. Chaff is very thin residues of the so called silver skin, the inner skin that surrounds the coffee bean. As far as I know it does not affect grinding. Chaff cannot be distinguished from the taste of the beans unless there is an awful lot of it, and then only as a slight muffling of the taste. A resting period of 24-48 hours is recommended by most people, but I can seldom wait more than 6-12 hours before tasting. But do not hesitate to taste it immediately! Also, you should try it after 4-6 hours, after about a day, after two days and also after three and four days. This way you will know when your particular bean or blend is at its best with your kind of bean container and with your extraction method. As you can see I use simple glass jars. I also have one airtight bag but I use it mostly for traveling. This tutorial would not have been what it is without the help of steves, another member of the TMC forum, who proof-read all of it, acted as a guinea pig trying out oven roasting for himself. And gave me valuable comments and questions on the subject, and on the language. Thanks Steven! Dont worry about coffee roasting! However you do it, you will quickly learn how your roaster works. All roasters I have tried so far give great results with a bit of training. The popper, the heatgun, the drum and the oven all give you what no pre-roasted commercial coffee can give you: absolutely fresh, absolutely individual, absolutely home roasted coffee, controlled by nobody but you! So don’t worry, just roast and be happy!